What about an SPR logo on the other side of the Name? Thanks for another great write up Jim, and well ridden too. It was a great experience to be able to show off my old stomping ground to my Aussie mates. Definitely a trip to be repeated. I reported an incident online about a year ago, and got a follow up call from the police. Looks like they take it seriously. Give it a go. There was a scary incident yesterday on the hills ride in Bickley Valley. After splitting on Welshpool Rd, the long and short groups crossed paths again at the intersection of Lawnbrook and Glenisla in Bickley Valley. Incredible achievement Ben – well done. You proved that good things happen if you make a plan, stick to it, and aim high. Imagine a race with 35 000 participants, through some of the most spectacular scenery in the world. Imagine joining the likes of, Indurain, Ulrich, Vinokourov, LeMond and Armstrong who have all had a go. Well now you can. In March next year a few of us from SPR will head over to Cape Town, to ride “The Argus“, and we’d like you to join us. 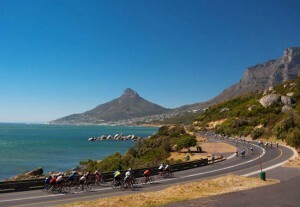 The Argus Pick ‘n Pay Cycle Tour covers 110km of spectacular Indian and Atlantic Ocean Coastline, with about 1000m of vertical ascent, with heaps of awesome scenery, and cheering crowds to help you along. The event is as well organised as you’ll see anywhere in the world, with full road closure, medical and technical support and carefully staggered starting. And if that’s not enough, there are two choices of four-day amateur tours nearby in the week leading up to the Argus on 8th March. The Cape Rouleur (yes, they copied our name!) and the Tour de Boland. Minimum duration for a worthwhile trip to South Africa is probably 10 days, but some may choose to do an extra week, and include a safari. There are plenty of great destinations nearby to choose from, and the Aussie $ goes a long way in South Africa. We actually just booked our flights last week to go to the Argus! Were you thinking of organizing a group to ride together for the Argus? Chris is a Cape Town native and has lots of insiders knowledge if you need. Sounds very exciting! Looking fwd to seeing you guys there. I’m also a Cape Town boy, and have done the Argus 11 times, so should be able to answer most questions. Depending on the range of experience we have, we may choose to ride in the same, or separate groups. Either way, we’ll all be in SPR kit. The guys I’ve been talking to will be chasing sub-3 times, so probably looking at B or C group. The organisers have been quite accommodating in the past with touring groups from overseas. Will firm up plans as numbers finalise. Thanks Nigel and Heiko for braving the rain. A great ride through the mud and the water, and finishing in glorious sunshine. See you again next time.